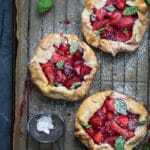 A couple of Christmas’s ago I had made a big Strawberry and Basil Galette for my family for dessert on Christmas Eve. I had completely made up the recipe and just kind of thrown it together to use up some strawberries that were lurking at the bottom of the fridge and soon to turn into a science experiment if I didn’t act quick. So it was a bit of an after thought as the star of the show was this amazing two tier chocolate, almond and cherry pavlova which I had magnificently set on a towering cake stand. It was a masterpiece, especially set along side this old rustic galette that I had just thrown on an old chopping board. You can guess which one everyone loved though? 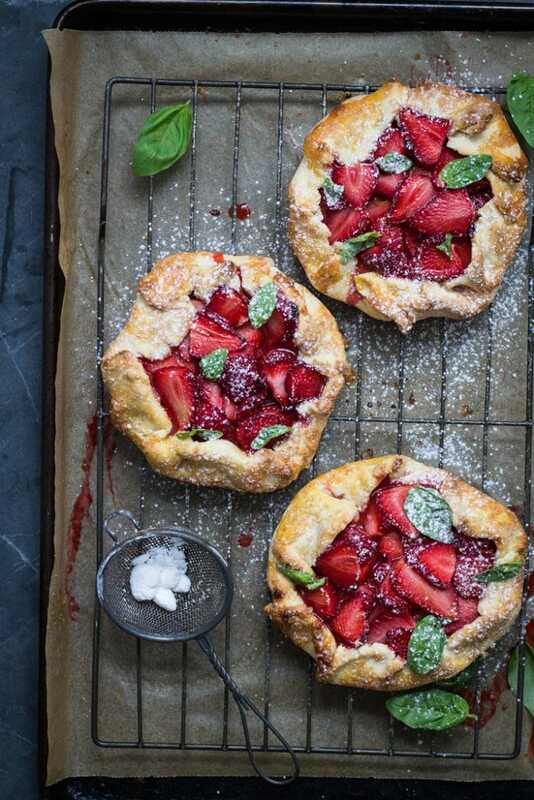 Yes, the Strawberry and Basil Galette! My poor pavlova peacock, everyone loved the galette. So the other day my mother-in-law asked me to make it. Eeek! Awkward…I have no idea how I made it. I struggled to even remember making it. Why? a. I was pregnant the first time I made these two years ago…a.k.a. Kate’s brain wasn’t working at full speed back then. b. I am currently up…oh, around 4-5 times a night to my darling boys…so brain is working even more slow these days when I’m trying to recall the recipe. c. Brain was never that great to start with….potentially suffering from a crayon problem? 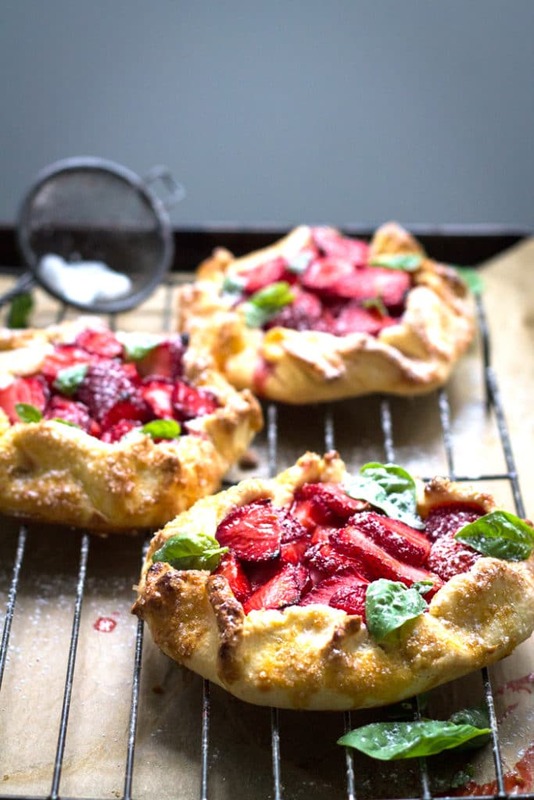 Flash forward a few days of experimenting (not that anyone around my family ever complains about eating more baking in the name of recipe development) and I think I have a recipe for the hugely popular Strawberry and Basil Galettes. 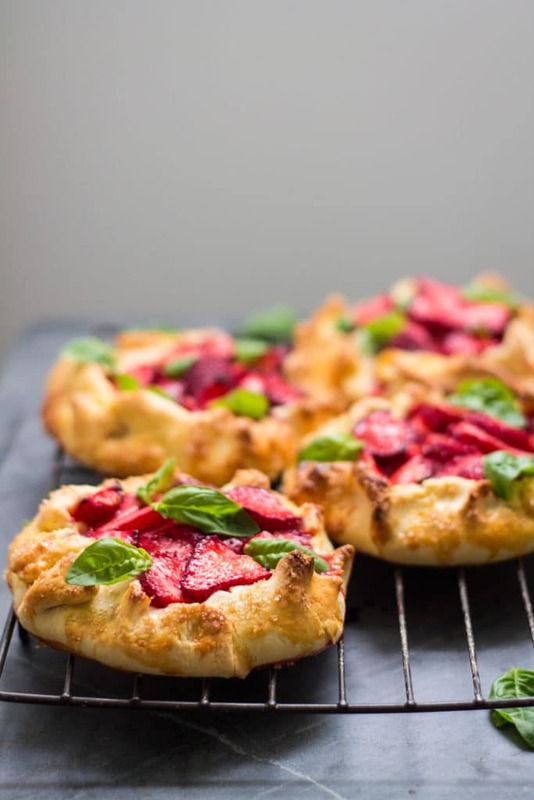 I know, you’re probably questioning the strawberry-basil combo, but the summer freshness and fragrance of the basil really goes with the strawberries, it’s a bit like how awesome tomatoes and basil are together…they’re each other’s lobsters. 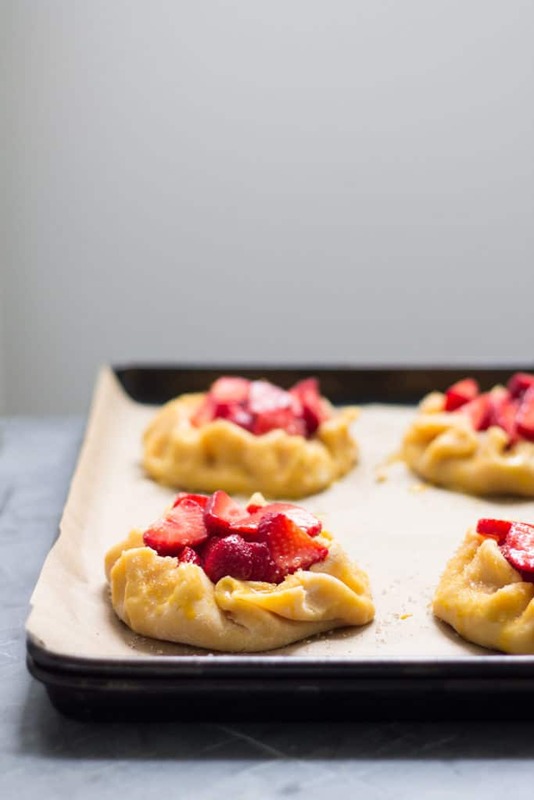 Then add a little zing from some lemon, a little sweetness, some nutty almonds and crumbly, buttery short pastry and you have a delicious unpretentious summery dessert. But let’s not forget a big dollop of vanilla ice cream, whipped cream or mascarpone on top (or all three, I’m not judging) …that’s mandatory. Yup, I am seriously considering that crayon diagnosis more and more. I really struggled to write today, or perhaps I just need more caffeine…. ….no, I definitely suffering from a crayon situation. Place flour, icing sugar, lemon zest and butter in a food processor. Pulse until combined and mixture resembles fine breadcrumbs. Add egg yolks and water and pulse until just combined. Mixture should resemble large clumps of wet sand. Do not over mix or your pastry won’t be flaky. Tip out the mixture onto a piece of cling film and gently bring together into a disk and place in the refrigerator for 1 hour. Preheat oven to 180C/350F on fan bake. Line a baking tray with baking (parchment) paper. 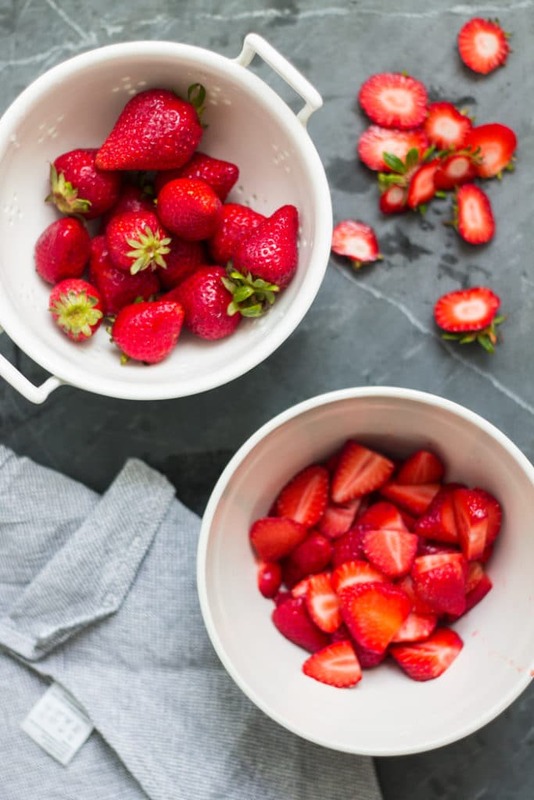 In a medium bowl mix together the strawberries, lemon zest and juice, caster sugar and vanilla. Set aside. Remove the pastry from the refrigerator. Divide into four even pieces. 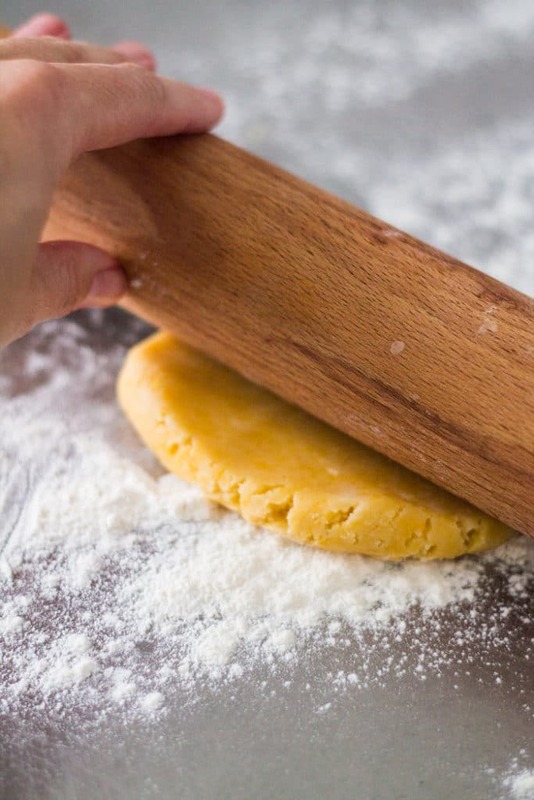 Roll each piece out into a circle on a lightly floured surface until the dough is about 3mm/0.1in thick it will be around 18-20cm/7-8in in diameter. Divide the almond meal between the pastry circles and pile up in the centre 12cm/5in. 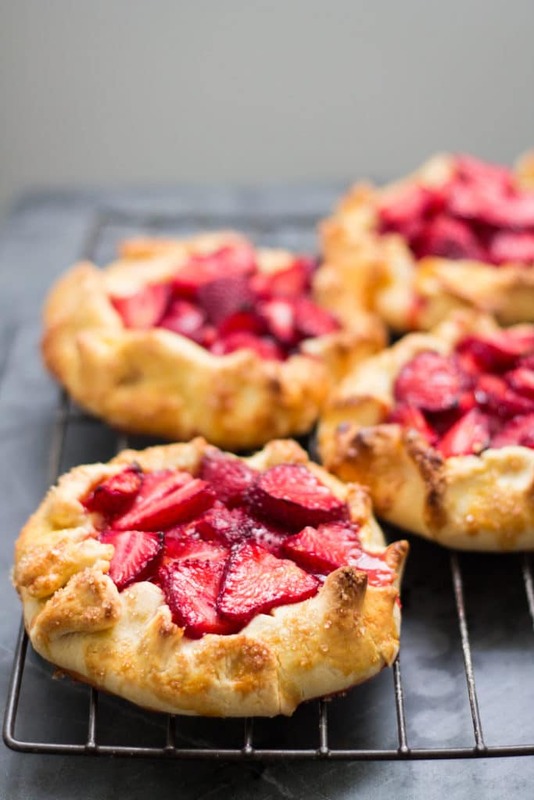 Divide about 3/4 of the strawberry mixture between the four pastry circles and spoon it onto the almond meal. Gently fold up the edges of the fruit and pleat it to stop all the juices running out. Check for any holes and gently mend these as you don’t want any of the juices running out and burning. 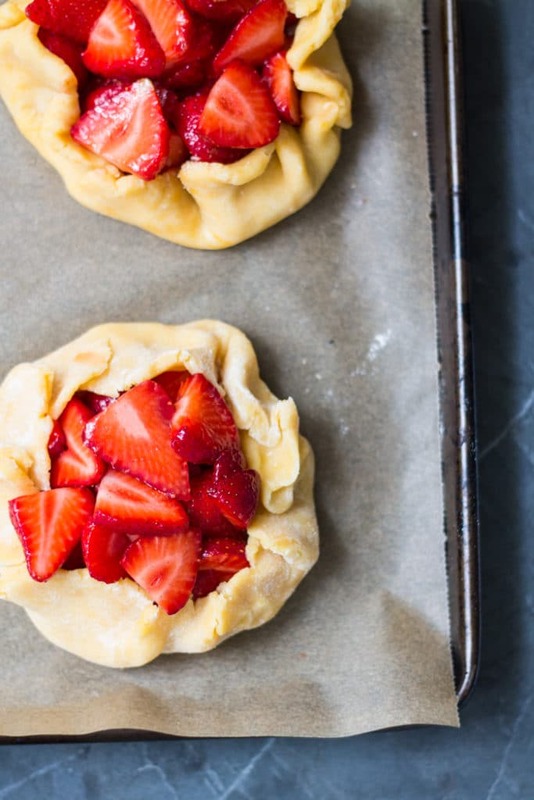 Divide the remaining fruit and fill the remainder of the tart with these (it’s best to do it like this as it makes folding up the pastry easier then they’re not completely full). In a small bowl lightly beat the egg together with 1 Tbsp of water then brush onto the pastry edges using a pastry brush. 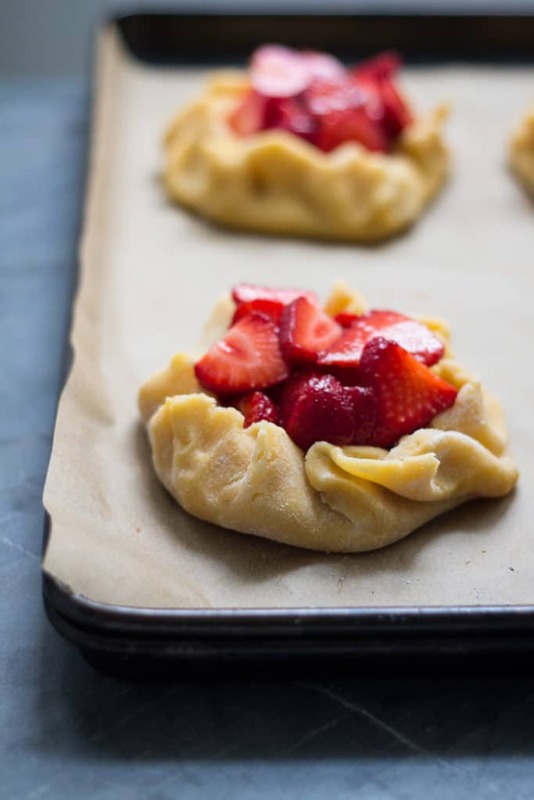 Sprinkle over the raw sugar then place in the oven and bake for 15-20 minutes or until the pastry is turning golden brown. 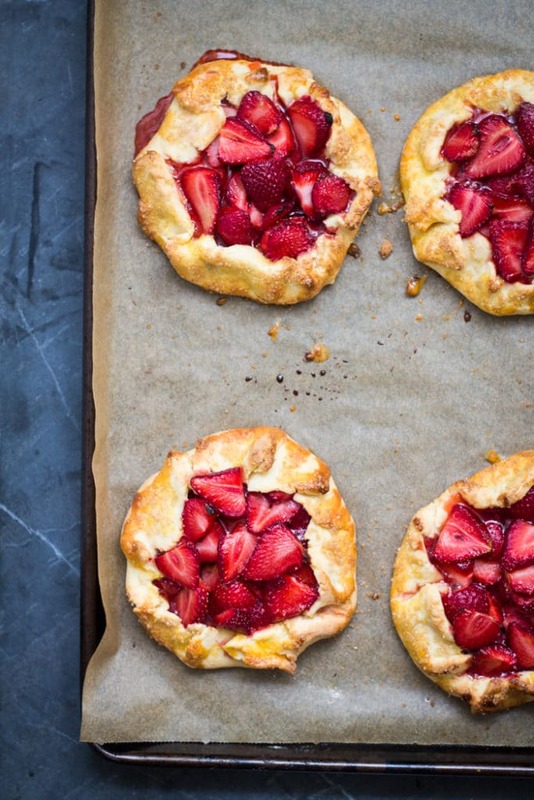 Once cooked remove from the oven and carefully transfer the tarts to a wire rack to cool. Doing this now will help keep the base of the tart nice and crunchy and prevent it going soggy. 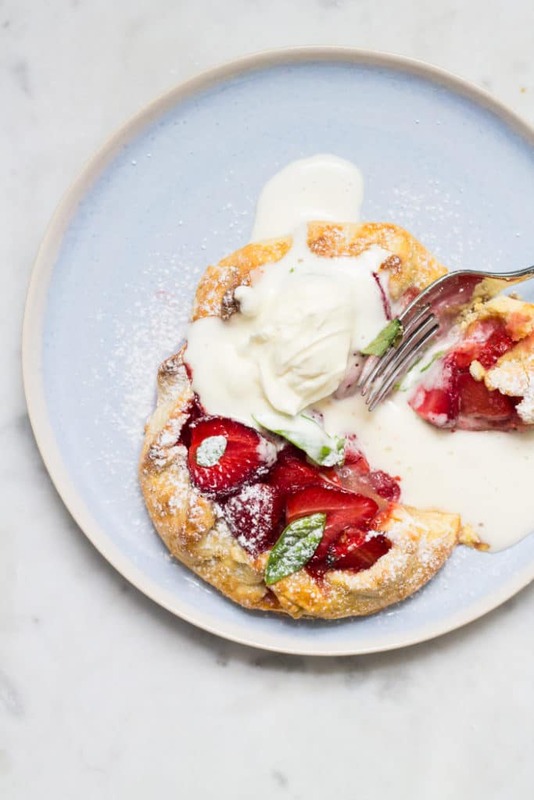 Allow to cool slightly (or completely, depending on your preference), scatter over the basil leaves and serve with a big dollop of vanilla ice cream, whipped cream or mascarpone. Best eaten on day of making. Thanks so much Inci! Surprisingly strawberry and basil actually tastes awesome together, and look pretty too. They are feat to the eyes! I can totally imagine how incredibly delicious they must be! Thank you so much Priyanka for your lovely comment! I think they taste even better than they look! These were delicious and tart. I will make these again! Thanks so much for coming back to comment Michelle, it’s so kind of you! I am so pleased you enjoyed the galettes. I’m a tad jealous of you right now, wish it was strawberry season here in New Zealand too. Enjoy your summer!